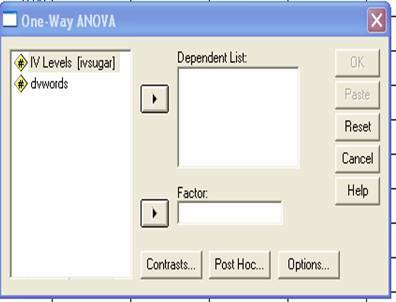 How do I analyze data in SPSS for a 1-way between subjects ANOVA? 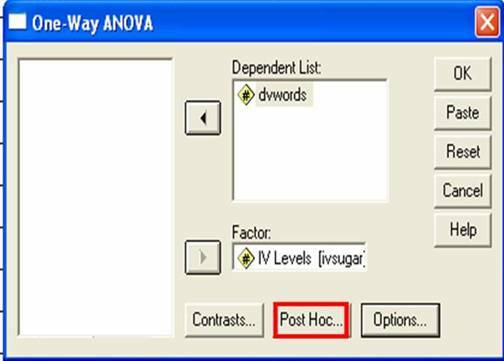 Home > How do I analyze data in SPSS for a 1-way between subjects ANOVA? 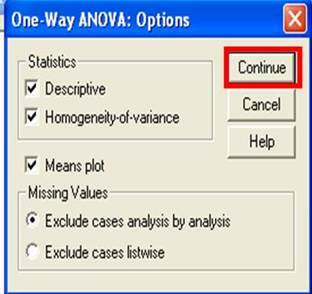 Click Analyze, Compare Means and then One-Way ANOVA. This box will appear. You will see your two variable names in the window on the left. Your goal will be to transfer each to a corresponding box on the right. Click on the IV name to highlight it. 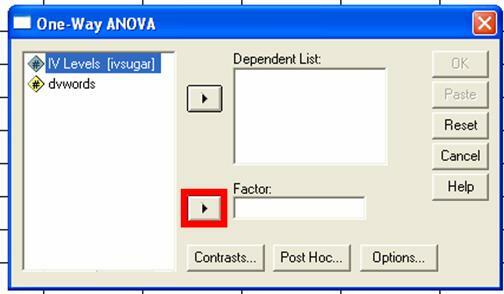 Transfer this variable over to the Factor box by clicking on the corresponding arrow. 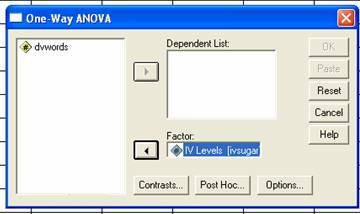 Your IV will appear in the Factor box. Now it’s time to move the DV over. Click on your DV to highlight it. 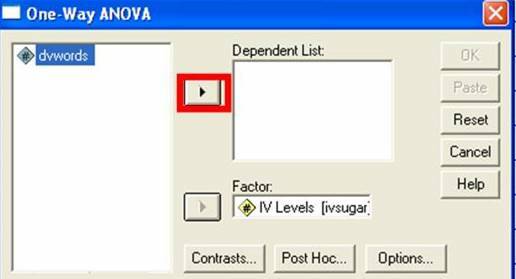 Move your DV over to the Dependent List window by clicking on the corresponding arrow. 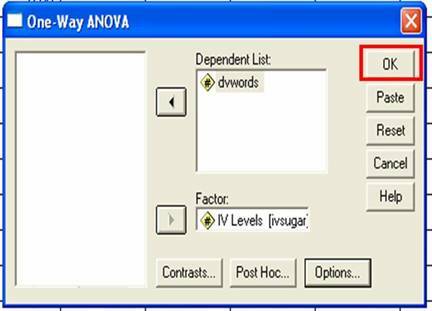 Your DV will appear in the Dependent List window. When you see this, click the Options button. This box will appear with a variety of options. 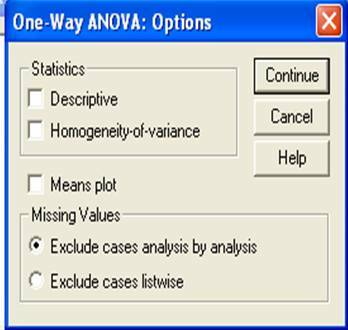 Click the check boxes next to Descriptive, Homogeneity of Variance and Means plot. When you click each box, a check will appear to indicate that it has been selected. 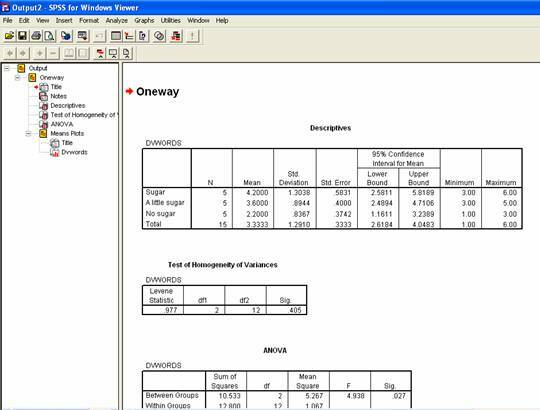 Check the Descriptives and Homogeneity of variance boxes. Click the Continue button when finished. You will see this box again. Click the Post Hoc button. This will appear. You will see many options. These options represent various types of tests that you can conduct. 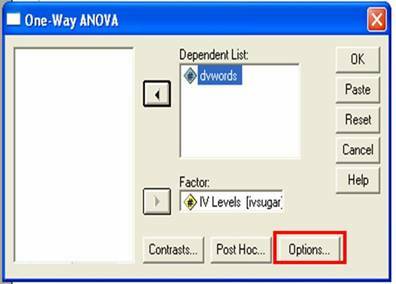 Select at least one option from the Equal Variances Assumed area and at least one option from the Equal Variances Not Assumed area. To select an option, click on the box next to the name and a check will appear. 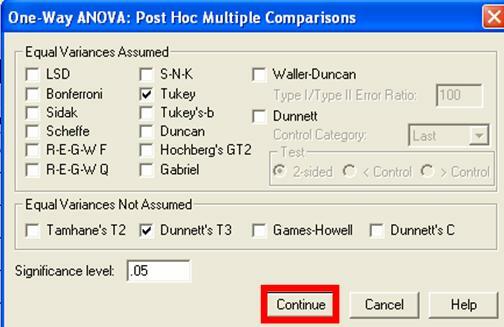 For this example experiment, I will choose Tukey from the Equal Variances Assumed area. That is a popular choice. 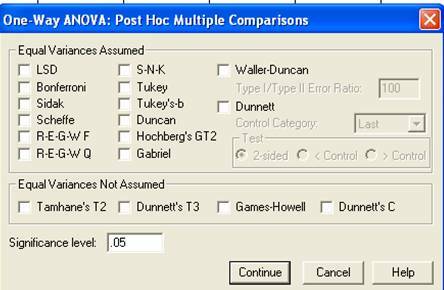 I will choose Dunnett’s T3 from the Equal Variances not Assumed area. Your professor may ask you to choose a different test and that’s ok too. These tests vary in terms of how strict they are. Click the Continue button when you are finished. In this box, click the OK button and wait a few moments for processing. You will probably see so much information that you will have to scroll down the right hand side to see it all.